There’s the sleeveless A-line underdress, that’s slightly below the knee. Over that goes the jacket, which doesn’t close in front. 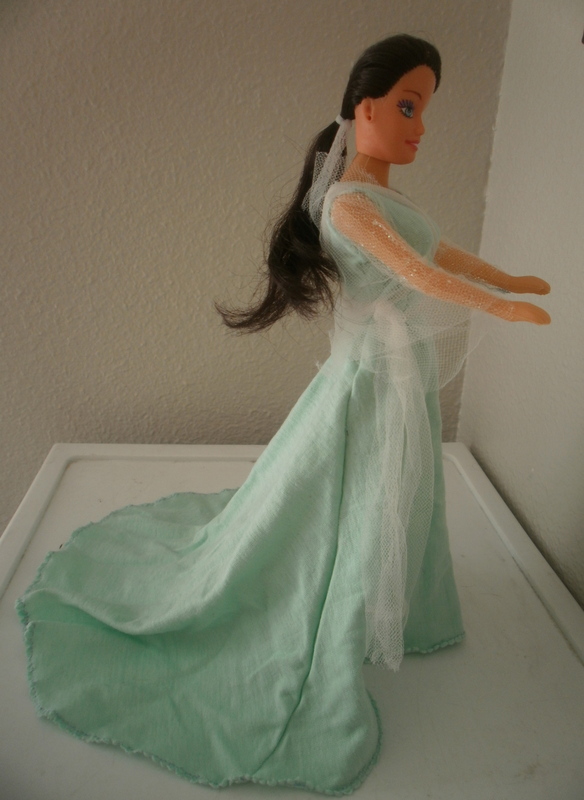 The doll wears white plastic pumps. A green twistie-tie belt is worn in the last picture. I started off of a pattern on which I made adjustments. 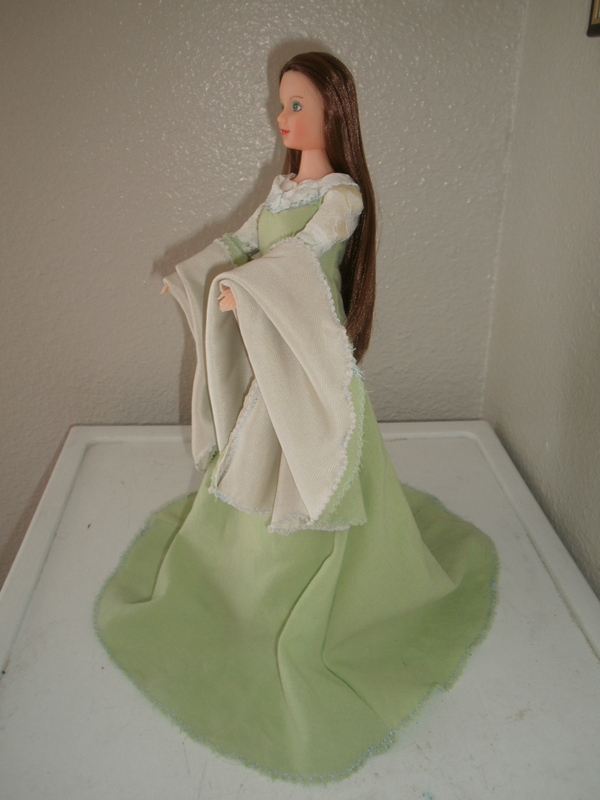 There is an underdress of tan leaves on a dark green background. 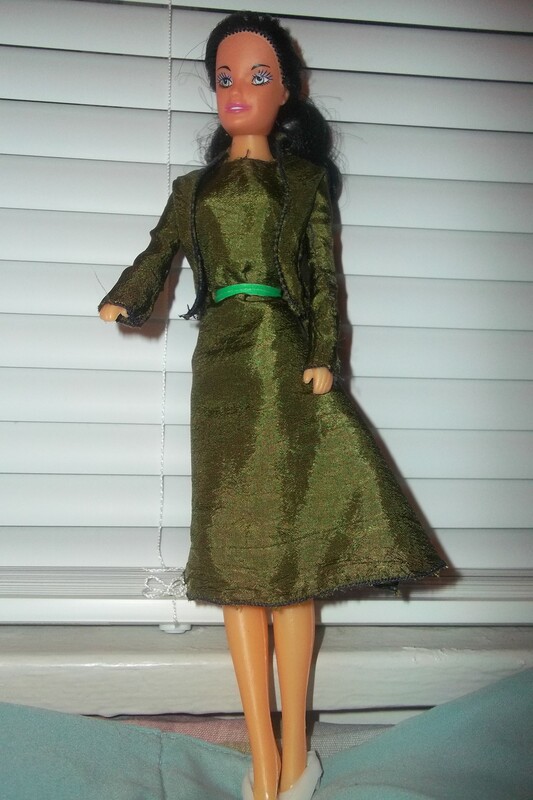 The overdress is a lightweight dark green. As for the design, I incorporated the elements I like best from each dress. 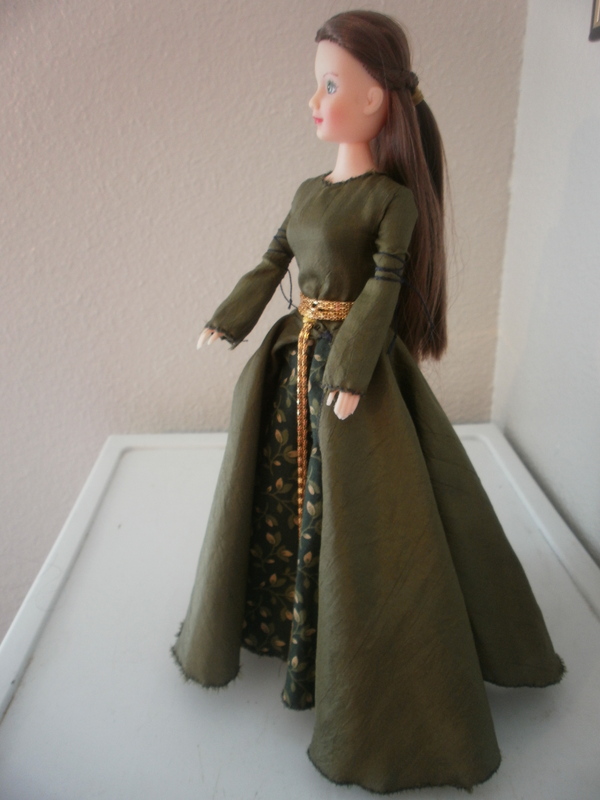 The overdress skirt, rather than having a gap in the front which a panel covers (as in Eowyn’s dress), is a full circle only split toward the side. 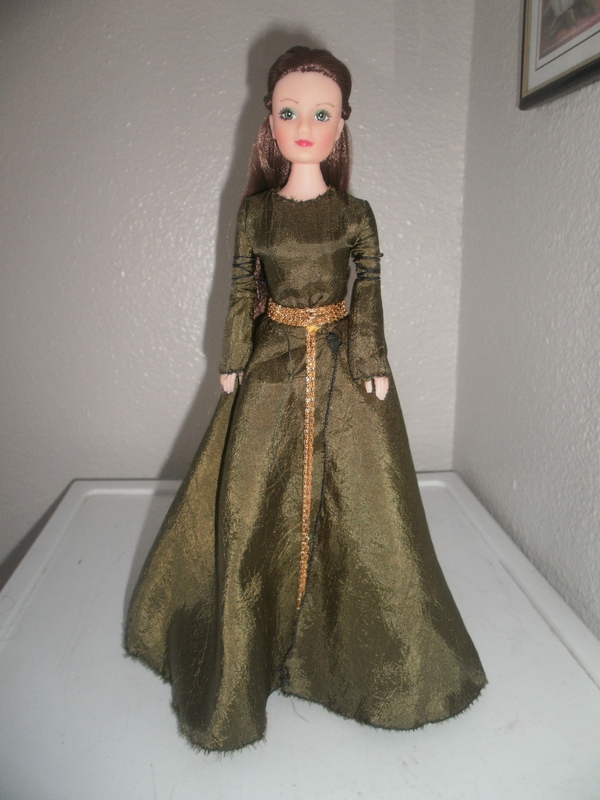 This is so it can be worn like either Susan’s or Eowyn’s skirt.The sleeves are smaller, more like Susan’s than Eowyn’s. 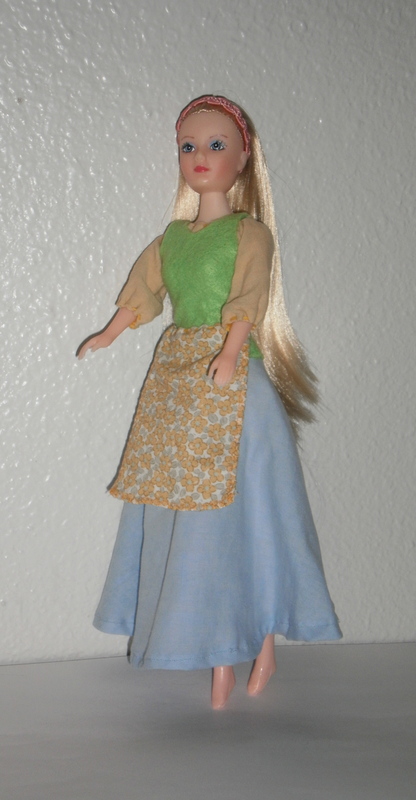 I added ties on the upper arms because they were an element of Eowyn’s dresses that I liked but hadn’t used much. 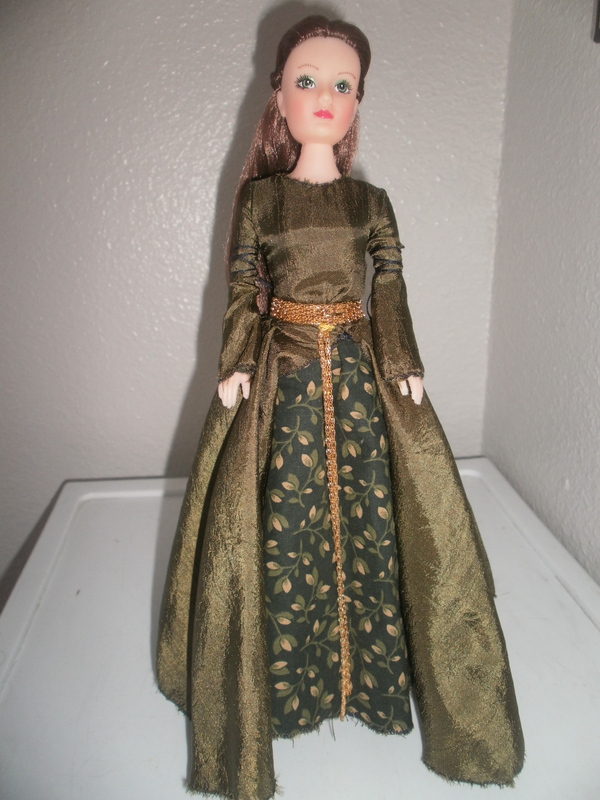 I left off Eowyn’s gold yoke and collar, and Susan’s white upper arm decorations. The belt is 2 Indian gold-plated necklaces. 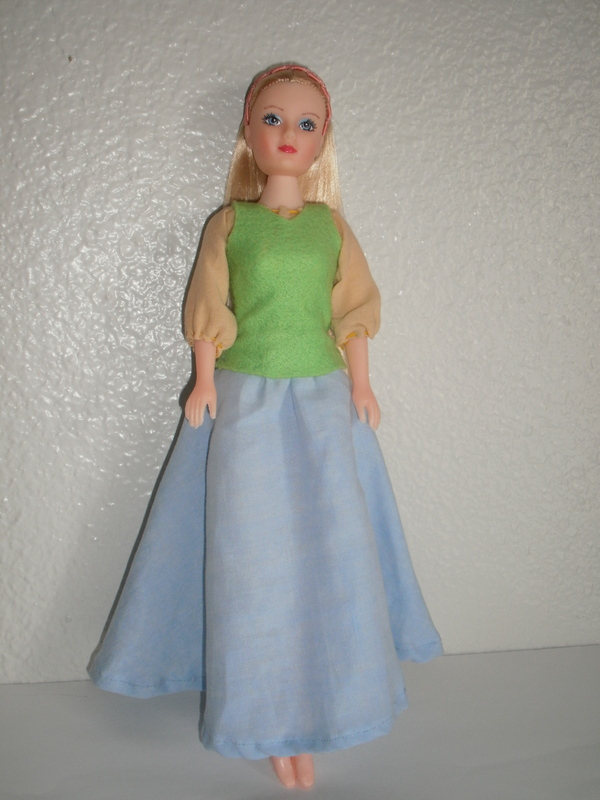 The doll’s hairstyle is the Narnian style–2 braids pulled back into a half-ponytail. Here’s an original creation. It’s based on early 20th century styles. The dress has a pretty long train. A twisted strip of lace makes a kind of sash in front that’s fastened at the side. 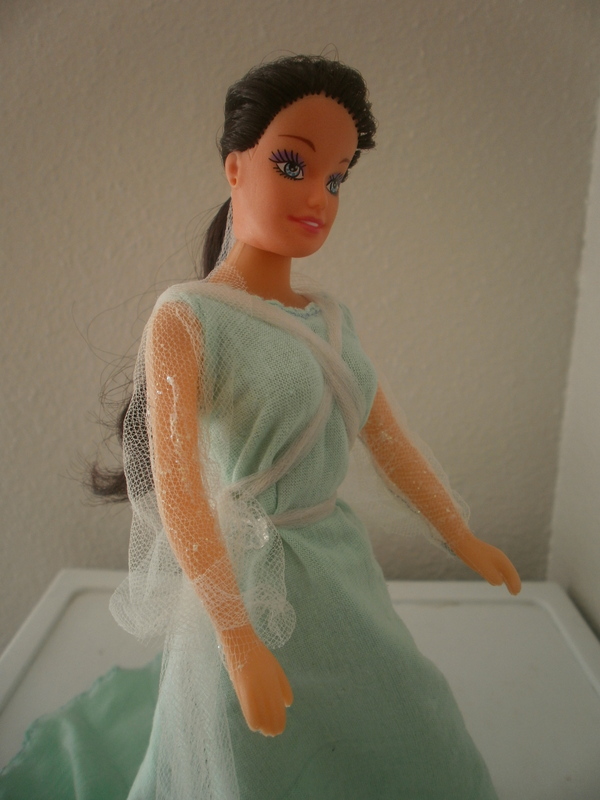 There are lace sleeves, which are embellished with some crystal glitter glue, and a short lace cape. 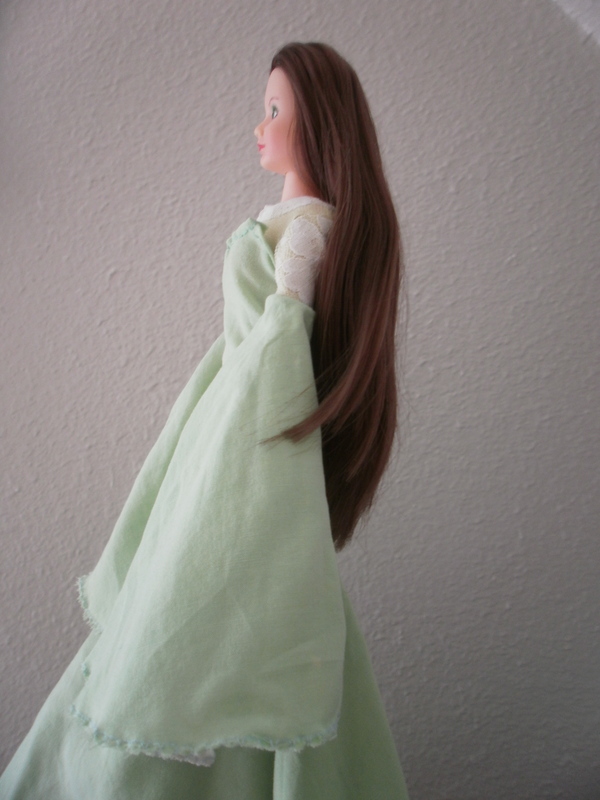 This is a really pretty Arwen dress from the movie “Return of the King.” I couldn’t get the right material for so long, then all of a sudden I found this Indian petticoat with a real nice drape, which I then used for the overdress. The overdress is really long, giving that nice “pooling” at the bottom. 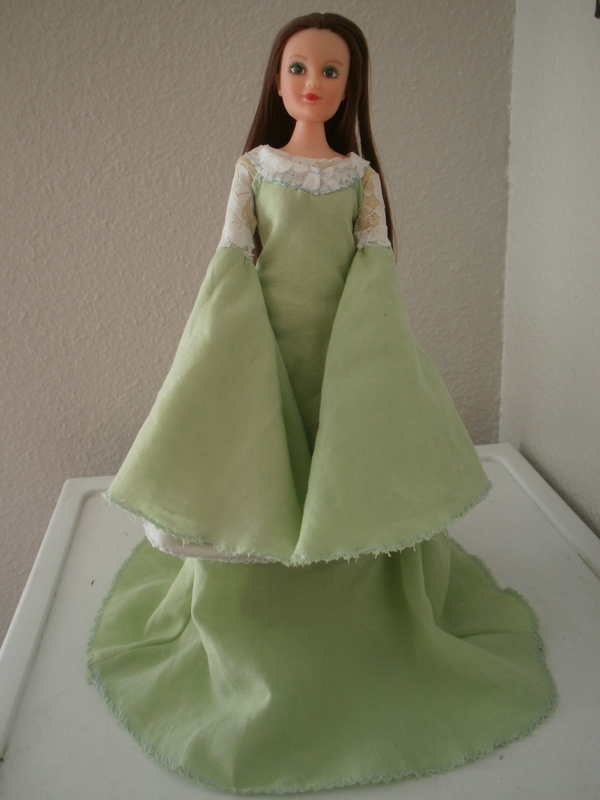 Both parts of the 2-part Elven sleeves (on the underdress) have 2 layers. 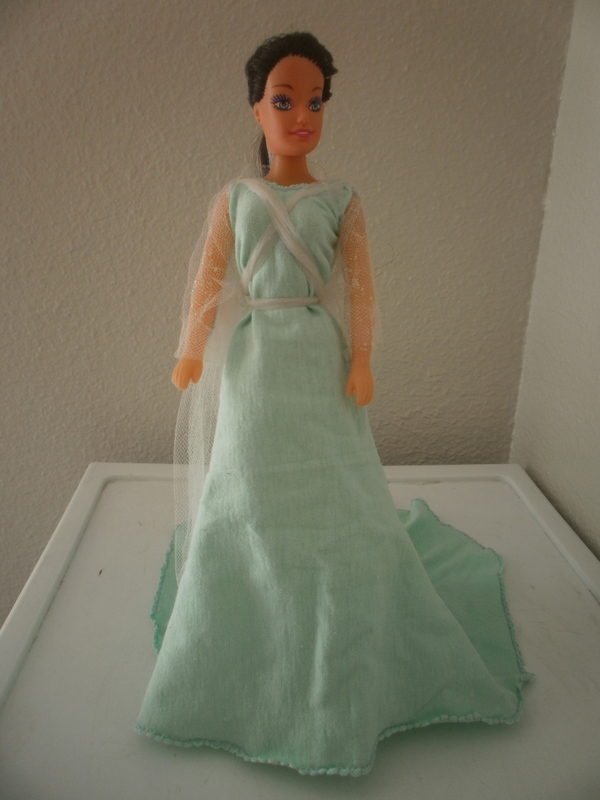 The top part has lace over light green cloth, and the 1/2 circle lower part has a sheer under layer. 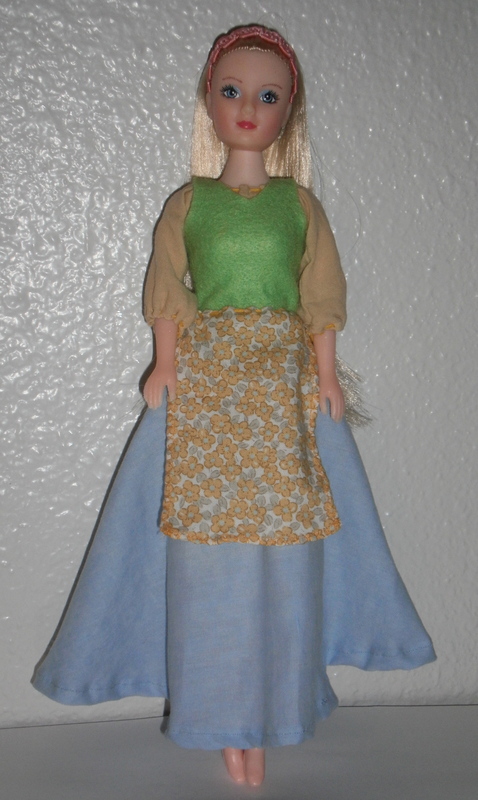 This was the first doll costume I made. 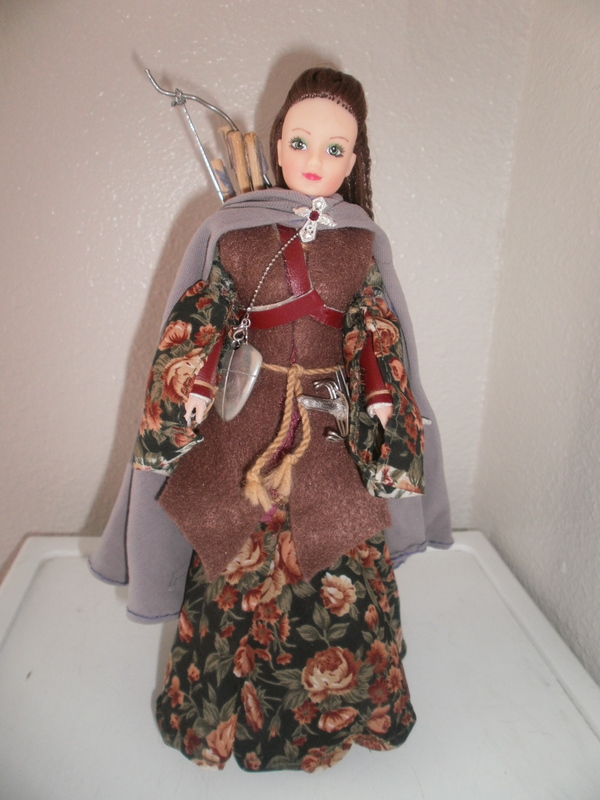 It started as a skirt and top and I just kept adding to it 🙂 Its style is largely based on that of the members of the Fellowship in the “Lord of the Rings” movie trilogy. It’s a dress, of course, because she’s a girl 🙂 The sleeves I patterned after the Elf-princess Arwen’s sleeves on her battle outfit. 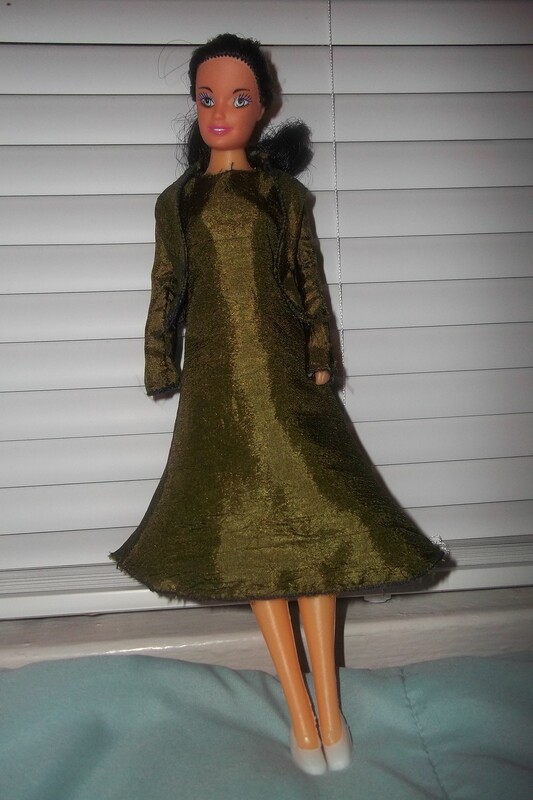 (That outfit isn’t in the movie because the storyline in which she fights at Helm’s Deep fortunately got dropped–but there are pictures of the dress.) The vambraces are like the ones Arwen uses in the fight. 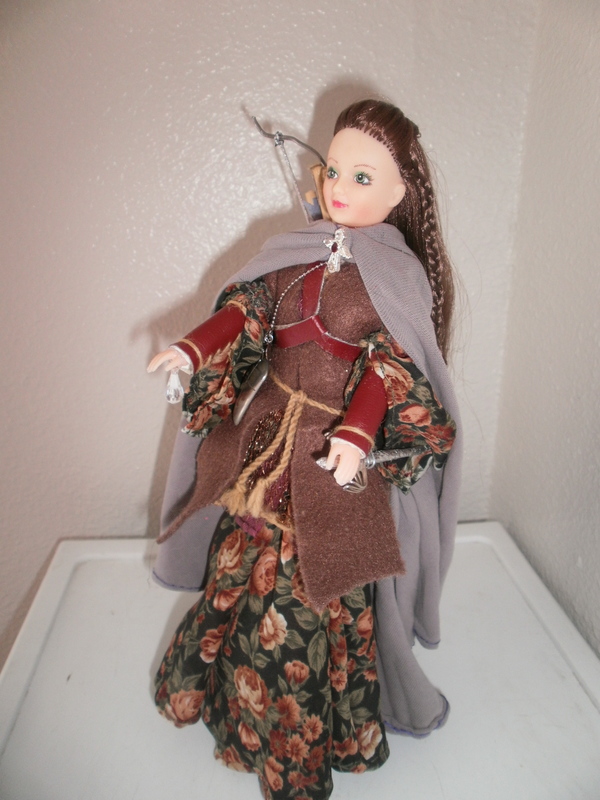 The doll also has leggings like Arwen does sometimes. The jerkin is based on the Ranger Aragorn’s leather jerkin (mine is felt). 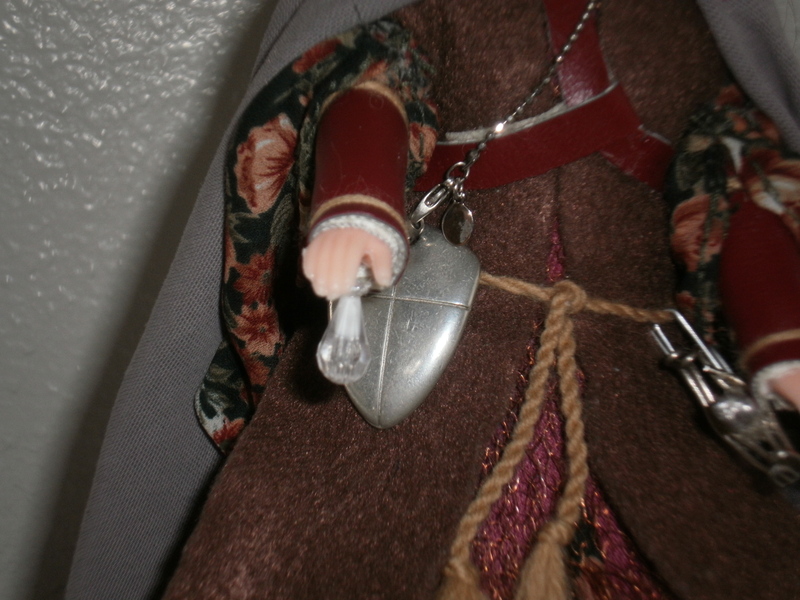 The doll has a dagger like he did. Mine is handmade out of a wood skewer, foil and a paper clip. You can’t see it too well, but she has on under the jerkin a sleeveless coat of “chainmail” made of an unrolled copper pot scrubber. That came out really well and is reminiscent of Frodo’s hidden coat of mithril. The bow and arrows I made a while ago. The bow can actually fire the arrows. I wrote up a how-to on how to make those–here it is. I modified the quiver to fit like Legolas the Elf’s. 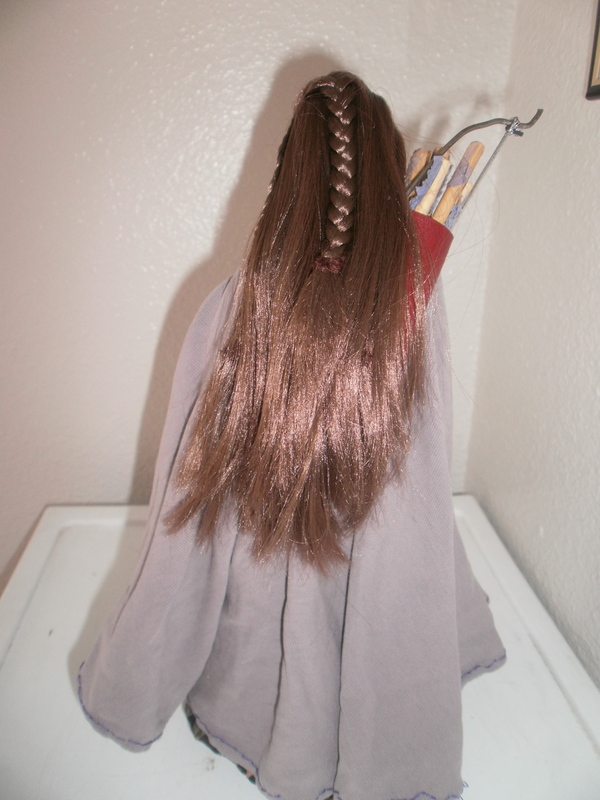 Her hairstyle is also based on Legolas’–1 braid down the middle, 2 small ones to the sides. The cloak is a full circle and made of an old T-shirt, so it drapes really well. It’s patterned after the cloaks the Fellowship gets in Lothlorien. Accessories I didn’t make are the buckler ( a shield pendant I got for my birthday) and the cloak clasp (an angel pin). This was made out of 2 small beads to resemble the phial of Galadriel given to Frodo the Hobbit. Plastic boots complete the outfit.